Todd E. Feinberg and Jon M. Mallat. 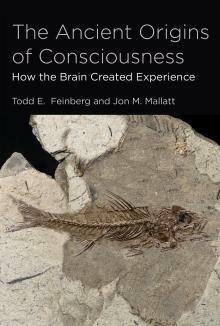 The Ancient Origins of Consciousness: How the Brain Created Experience. Cambridge, MA: MIT Press, 2016. ISBN: 9780262034333. Hardcover. $35U.S. 392 pages. Illustrated. As I write this review, an old story has been circulating on social media about a Frenchman who has 50-75% less than a normal size brain, an IQ of 75, and who yet functions normally, has a family, and is employed. That is, he has all the requisite brain parts, but each one has been miniaturized. How is it possible for someone with so little brain to function normally? To some extent neurologist Todd E. Feinberg and biologist Jon M. Mallat address this fascinating question in their book, The Ancient Origins of Consciousness. Organisms do not need overly complex brains to survive. In fact, sensory consciousness dates back to as long as 560 million years ago (mya) in tiny brains, according to these authors. Of course the subject of Feinberg and Mallat’s book is not so straightforward. Indeed, they tackle philosopher David Chalmers’ hard problem of consciousness: How do the functions and mechanisms of the brain result in phenomenal, subjective experience? How is being in function? Here is a book by research scientists laden with data about, at base, philosophy of mind. On the spectrum of 1 to 10, where at 1 sit those who claim consciousness from material properties to 10 where we find the non-materialist metaphysicians, these authors clearly lean to 1. They claim to have cracked Chalmers’ hard problem, which won’t sit well with many near the 10 spectrum. The Ancient Origins of Consciousness is a copiously illustrated with figures and tables, fairly easy to read for the non-specialist, well organized in ten chapters, and offers a cogent argument for the early origin of primary consciousness. The book includes a comprehensive index and boasts a robust bibliography. It is important to emphasize that their angle is on sensory consciousness and the authors are careful to state on a number of occasions that their mission is not to find the origins of, for instance, theory of mind (or other high functions of mind like reflection or intelligence). They do not claim that higher order consciousness is 500 million years old. Instead, they chart a careful and precise genealogy of primary consciousness using fossil evidence and research data. There’s nothing to dislike about this book, and it is worth owning for anyone interested in evolutionary or consciousness studies. The authors rightly begin with Thomas Nagel, and his notion of something it is like to be. Phenomenal experience or qualia don’t depend on super intelligence or large brains, they assert; and contrary to Chalmers, they set out to prove that they can detail objectively neural pathways and so explain subjective, primary consciousness. And they do. In terms of the evolution of sensory consciousness Feinberg and Mallat go beyond qualia and explain referral or the projection of neural states, mental unity via massive neuronal activity, and mental causation or how neurons effect action. In essence, the authors are looking for both the origin of affective consciousness and the hard problem itself – how the emergent what it is to be like is reducible to its components. The stages of consciousness run from the biological aspects of all organisms, to reflexes in the nervous system, to attention, which is more specialized and from which consciousness eventually arose. Consciousness is embodied – it needs the physicality of a particular brain to exist. Consciousness is a lively process of brain functions – it is not a structure. They quote Evan Thompson: “‘A living being is not sheer exteriority...but instead embodies a kind of interiority, that of its own immanent purposiveness’” (19). While a reflex is not consciousness, in the neural reactions we find the beginnings of the connections that will form consciousness. Reflexes constitute different cell types where neurons differ in types and functions, and the growing complexity, speed, and cellular diversity in turn created hierarchies (27). An example of a hierarchy would be how the function of the skin (touch) is represented in the brain or how the external visual field is mapped (i.e., various sense stimuli are taken together) in the brain. These mental sensations become part of what it is like to be. The explosive proliferation of animal life in the Cambrian Period is crucial to the argument presented by Feinberg and Mallat. However, they are keen to point out that before the Cambrian a very small brain had evolved in the predecessors to vertebrates. These non-vertebrate chordate ocean feeders, such as amphioxus, were able to detect chemicals and had a touch sense. While extraordinarily small, the brain of the amphioxus includes a forebrain, neurons, and primitive brain regions that control different functions. This brain is a precursor to that found in vertebrates. The neurons in amphioxus are not connected in synapses with neurotransmitters but use chemicals that modulate neurons, and this is the model for a simple, primitive pre-vertebrate brain. Not until the evolution of sense perceivers in vertebrates (eyes and ears) is there more complex sensory processing in the brain. Nonetheless, we see in the pre-Cambrian the birth of the brain. The Cambrian explosion runs from about 560-520mya and introduces vertebrates which then evolve complex nervous systems. Predation began in the period before the Cambrian, the precursor to the evolution of senses for defense and elusiveness, and these in turn became more complex behaviors and system in terrestrial vertebrates with the environment’s wealth of oxygen and more opportunities for foraging better types of resources. The cost of evolving such mental sensory maps was high in terms of energy needs, and only the clades of arthropods (mostly predators) and vertebrates (in Cambrian early fish) evolved sensory systems; it was less costly for others not to evolve complex systems, and this explains why we still have, for instance, clams (64). Even before the Cambrian, sensory consciousness was possible, as with the amphioxus. It’s just that in vertebrates the brain parts become not only larger but also more precise in segmentation and neural hierarchies. As the vertebrate brain evolved, so did its cerebrum and cortex, areas dealing with, among others, memory and decision making. Eyes went from forming images to forming spatial images, and any complex mental images needed to be processed and interpreted across several brain regions. Sensory processing of images, smells, and sounds are recalled, referenced to, and modified as necessary with new inputs. While the hippocampus brain region (memory and selective attention) is not apparent until the vertebrates, the genes to express it existed much earlier. Furthermore, the authors go as far as saying that in the Cambrian vertebrate brain not only were predictions made but simulations, that is, the manipulation of mental images. Based on the foregoing, Feinberg and Mallat move to sentience (and devote two chapters to the subject). Sentience is “when an organism becomes consciously aware of its own internal bodily and affective feelings,” like pleasure or pain (129). The affective limbic system, not in contact with the environment, is involved in attraction (pleasure), aversion (displeasure) and so employs valence; there is self, good/bad feelings, sadness and joy, and fear; there are motives. Affective consciousness (compared to exteroceptive, external mental images, and interoceptive, visceral pain), is found in subcortical limbic areas going back 560mya. That is, they do not find affective consciousness originating in cortical regions, which come later. What are the behavioral criteria for affective consciousness, they ask. Beyond any reflex response, the answer would include any non-reflexive response of valence, a decision about cost/benefit, frustration, and self-medication (as in awareness of acute pain so as to alleviate it). They insist, however, that some goal-driven rewards could reflect an unconscious behavior (153). Simple affective neuro-structures can be found in lampreys (still present but of ancient origin) and other fish. Must an organism have a backbone to experience simple consciousness? What about insects, mollusks, flatworms, etc.? The authors set out criteria for consciousness: 1. Complexity. Insect brains are too tiny. 2. Multisensory neuronal hierarchies. We do find this in insects. 3. Isomorphic (topographical/physical) sense pathways. Yes for insects. 4. Reciprocal neural interactions. They say yes for insects but debatable for other organisms without a backbone. 5. Separate sense pathways that merge in a brain for unity of experience. This is highly debatable in insects. 6. Memory. Yes for insects. 7. Selective attention. Also yes for insects. In all, insect consciousness is debatable. However, they claim the main criterion of sensory consciousness is mental image formation, and this is evident in bumble bees and so therefore in other arthropods. Clearly consciousness evolved to benefit vertebrates more than other organisms. The final chapter is a mega-conclusion that reiterates and pulls together much of what came before. They offer and discuss in detail three postulates. 1. Sensory consciousness is emergent with emphasis on the hierarchy of sense modes across and in network with brain areas. 2. Consciousness arrives through a continuum of species and adaptations. There is a diversity of consciousness (i.e. no single emergent process) in the brain and interaction among: exteroceptive consciousness (images/sensation, distance senses); interoceptive consciousness (mental images/body senses); affective consciousness (inner feelings). 3. Concerning the hard problem, consciousness and mental unity are adaptive. Behavioral choices spring from unified mental maps that evolved over time and selection pressures to benefit certain organisms. Others did not evolve consciousness since it is costly, and they were able to survive without it. In terms of the hard problem, the authors are clear to emphasize that no machine can explain (since it only observes) one’s subjective what it is like experience. While an adaptation, consciousness is a process and “not a material thing” since it does not reside in one brain area (224). But there is no hard problem, because the brain does create personal experience and how the brain does so is explainable by virtue of scattered but interlocking physical matter. See “Man with tiny brain shocks doctors.” New Scientist, 20 July 2007. Web. The article reports on findings from the journal Lancet. - GregoryF. Tague, Ph.D. is professor of English at St. Francis College, N.Y., and the author of Evolution and Human Culture (Brill 2016) and Making Mind: Moral Sense and Consciousness (Rodopi 2014). Copyright©Gregory F. Tague 2016. Reprinted courtesy Consciousness, Literature and the Arts journal, August 2016.